– Open to discussion or argument. – Arguable, disputable, questionable, open to question, open to debate. – Controversial, contentious, doubtful, open to doubt, dubious, uncertain, unsure, unclear, vague, borderline, inconclusive, moot, unsettled, unresolved, unconfirmed, undetermined, undecided, unknown, up in the air, not yet established. – A piece of landed property, especially one of large extent with an elaborate house on it. – The legal position or status of an owner, considered with respect to property owned in land or other things. – The degree or quantity of interest that a person has in land with respect to the nature of the right, its duration, or its relation to the rights of others. – Interest, ownership, or property in land or other things. 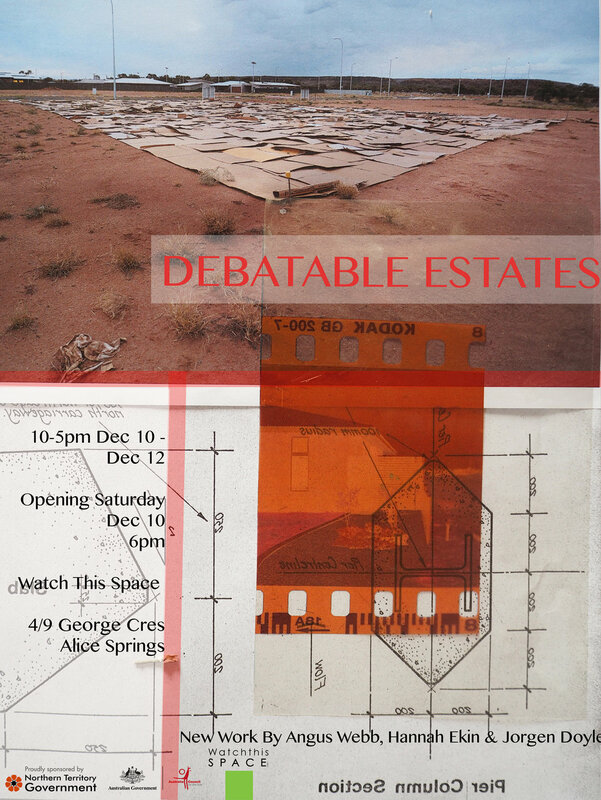 Debatable Estates explores contemporary Alice Springs as a site of contact between different, yet mutually implicated, modes of settlement. These contemporaneous modes of settlement are works in progress, reproduced through ongoing, often stark, encounters. Yet the ground on which these encounters occur is itself up for debate, and the topography upon which settlement occurs remains unresolved. Debatable Estates asks whether conceptions of settlement might be productively shifted through a radical doubting of the ground on which foundations are laid and plans concretised, and whether this doubt might renew settlement as a site for meaningful encounter.